The National World War 1 Museum and Memorial is not a memorial to the war. Rather, it is a reminder of the results of the “War to end all wars”, which were peace, liberty, and rebirth. The five years of turmoil left the countryside scarred, and families broken. It did not extinguish the human spirit, which rose above all of this to help heal a world that had been dark for so many days.We want to thank the World War 1 Museum for their hospitality. Rest assured that all opinions are our own. 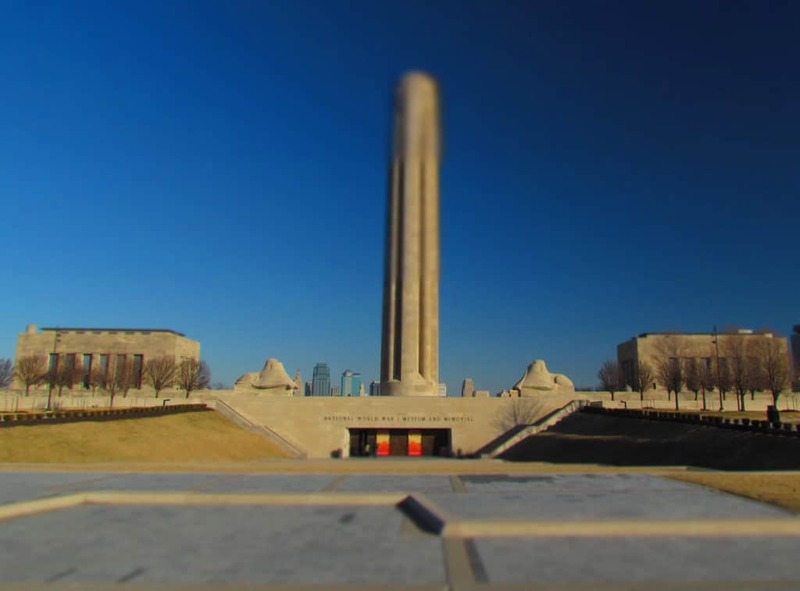 The same year that WWI ended, Kansas City leaders came together with a plan to construct a lasting memorial to those who served. By 1921, a site had been selected, and 100,000 people gathered for the dedication. Within five years, the memorial would be built, and an even larger crowd would be on hand for its opening. The museum served the city, and its visitors, for many years, but in 1994 it was closed due to structural concerns. A plan was made to revitalize, as well as expand the site, so that it could better showcase the growing collections of artifacts. 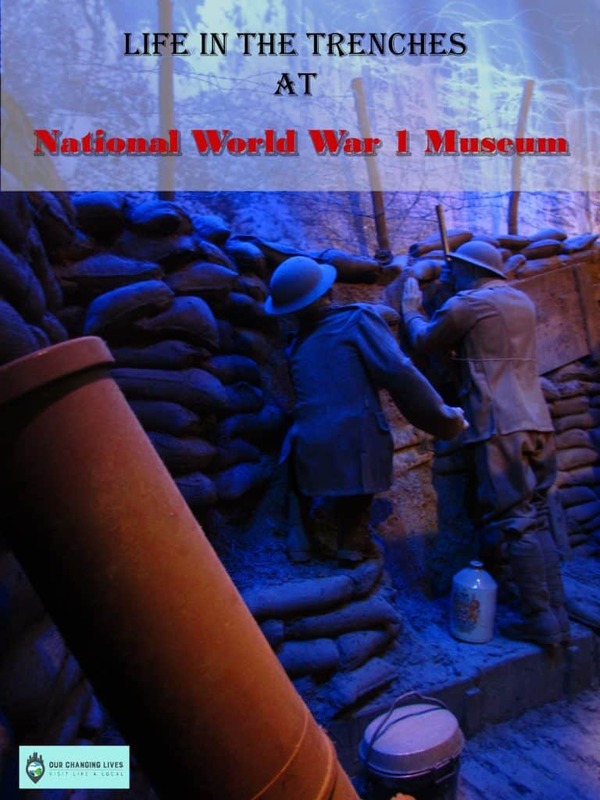 During this period it was given the distinction of being proclaimed the nation’s official World War 1 Museum. It reopened in 2006 to much acclaim. We returned for an in-depth look at our nation’s most esteemed collection of WW1 artifacts and displays. World War 1 was a battle fought in the trenches. Long series of trenches were constructed across the fields, and the battle of small gains was waged. The trenches were designed to slow the advance of the enemy, while offering limited protection from artillery. The trenches were often reinforced with wooden beams and sandbags, as well as guarded with barbed wire. Flooding was a concern, as well as infestation by various pests. Life in the trenches was difficult, and soldiers would often rotate through them in stays of up to two weeks. It is estimated that if all of the trenches dug out during the war were laid end to end, they would total over 25,000 miles long. To combat entrenchment, new guns were developed. These new weapons could throw shells higher, farther, and at a faster rate. A new “high explosive” shell design created an increased danger to the soldiers stationed in the trenches. Mortar style weapons became more commonplace, as they were able to lob the shells into the trenches. The addition of gas bombs increased the causalities significantly. In the early part of the 1900’s the world was going through a series of transportation changes. While the horse was still considered the mainstay for moving wagons full of supplies, gas powered engines were breaking ground in many areas. Railways had been in place for many decades, and were used to move troops to nearby towns. Supplying up to two million soldiers with the rations, ammunition, and other supplies became a daunting task. Motorized vehicles began filling the gap, but were limited by lack of roads, especially after heavy rains. This would be the last war that relied so heavily on animals for transportation. For centuries battles had been waged at sea. World War 1 would see the ushering in of new technology in this arena, as well. Britain was the naval power of Europe, and Germany was striving to match. Ship design had moved from wood to steel, which allowed for larger guns to be carried. To counter the development of Dreadnoughts, torpedo boats became more advanced. Over time, these destroyers would morph into the submarine class, which allowed for increased stealth. These were first used to interfere with shipping traffic, but would eventually be used against smaller warships. The increased use of interactive displays at various museums has become more commonplace in the past few years. This allows guests to further immerse themselves in the subject matter at hand. 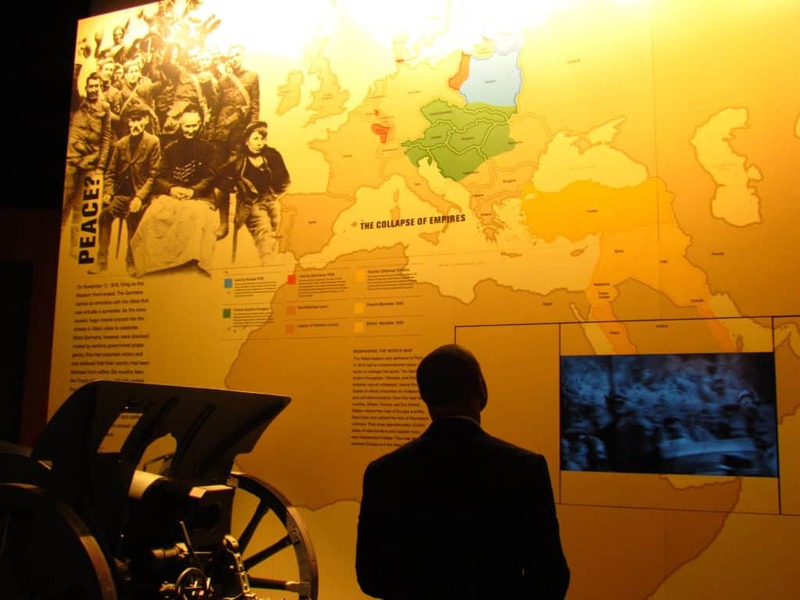 At the National World War 1 Museum, they have included various stations, which allow guests to take a look behind the scenes of what was happening during wartime. One of our favorites was a long illuminated table that had a series of stations. Here we were able to see the inner workings of a machine gun or find out more about the use of camouflage. One of our favorite activities was designing our own patriotic poster. These pieces of propaganda were instrumental in engaging those at home in ways to help with the war effort. As we made our way through the museum, we learned the chronological history of what occurred throughout the world during this time period. Displays show the political, social, and economical impacts that rippled through the nations. Information is presented in an easy to understand approach, and plenty of staff members are available to help shed additional light on the exhibits. Tours are available for those interested, and short films highlight key events that led up to, and took place during the war. After completing our tour of main halls, we headed over to the older section of the museum. The twin halls that were the original museum galleries are still used today. These days they mostly hold traveling exhibits, so it pays to check them out each time you visit the World War 1 Museum. During our visit, one held a display of posters. These important propaganda tools helped keep the folks at home connected with the war effort. The other hall held an exhibit that shed light on what was occurring around the war during the First World War. Both exhibits add an extra level of background information, which better explains the tone of the world’s mood during World War 1. As we made our way back from the older section, we came across the Over There Cafe. This in-house eatery offers guests a chance to eat like a soldier. The menu has items like Trench Stew, Army Goulash, and Chipped Beef, as well as a good assortment of handheld dishes. The dining area is adorned with flags of the Allied powers. Stop in for a meal or just some dessert. The monies are used to help fund the museum operations. Before we left, we spent some more time speaking with the volunteer staff members. Everyone we met was so helpful and informative. Be sure to interact with them during your visit. They are a wealth of information. I must admit I haven’t read much about this before. I really need to. But I love your account and your writing is beautiful. Sounds like it was a good trip for you. Thanks for sharing. Thank you for visiting our site, and the kind words. We hope you will become a regular reader. I really love your writing style! I must say, you really made me fell like I was part of the trip! Thank you very much for that compliment. We are so glad you enjoyed the article. What an interesting post! I had no idea there was a National World War 1 Museum in Kansas but I’ll definitely visit it if I’m in town. My great-grandfather was killed in action shortly after the Battle of Vimy Ridge so he spent much time in those terrible trenches. In fact, it was on one of the Allied offensives where they rose from the trenches at night to try to secure a key position when he was killed. His body was never found but his name is listed on the Vimy Memorial in France in recognition of his sacrifice. It would be interesting to see the exhibits on what was going on in the world during WWI as it’s information that is often overlooked. Also interesting would be a stop at the Over There cafe. Michele, thanks for sharing this personal account of your great-grandfather. I hope you have a chance some day to see it for yourself. Read about world war-1 at school. Reading your post is like a time travel. The new thing I learned is the war on sea and how various modes of transportation, never read so much on these points. Glad you enjoyed it. We love sharing history. My husband visited this museum and loved it. Thx for the great post. Thanks for visiting. I hope he enjoyed his visit to the museum. I absolutely love WW1 history. They sure don’t make wars like they used to! WW1 was a testament both to human resilience and tenacity, as well as depravity and desperation. It’s important to keep the memory of these things alive, so thank you for sharing your experience with us! Glad you enjoyed the article. Thanks for visiting. My husband Bill’s fraternity brother lives in Kansas City and they took us to this museum two years ago. Like you, I felt it was an awesome monument to the First World War which was fought in the trenches and with technology very much less advanced than today’s wars. However, I do not think it is the “War to end all wars.” The thing that moved me most was the feature on Hitler whose feelings about the losses and humiliation Germany felt during WWI planted the seeds for what he did in the Second World War. Unfortunately, you are correct. The name “War to end all wars” was probably a moniker applied in hope that there wouldn’t be another conflict of this scale. Too bad it wasn’t the reality. Thanks for visiting our website. We hope you return often. Wow a dining experience where you can actually sample something similar to that timeframe. I love all the exhibits and the new technology that the war brought to this time frame, so fascinating and what an amazing museum to visit. Thanks for visiting our site. The museum is amazing. We hope you get to visit it some day. I did visit this well-done museum many years ago. Your post has refreshed my memory. Glad we could spark these memories. Thanks for visiting our website. Come back often. Good timing on this post, 100 years later. We’ll make a point to visit the WWI museum when we’re in KC next. Hope you make it soon. Travel safely! 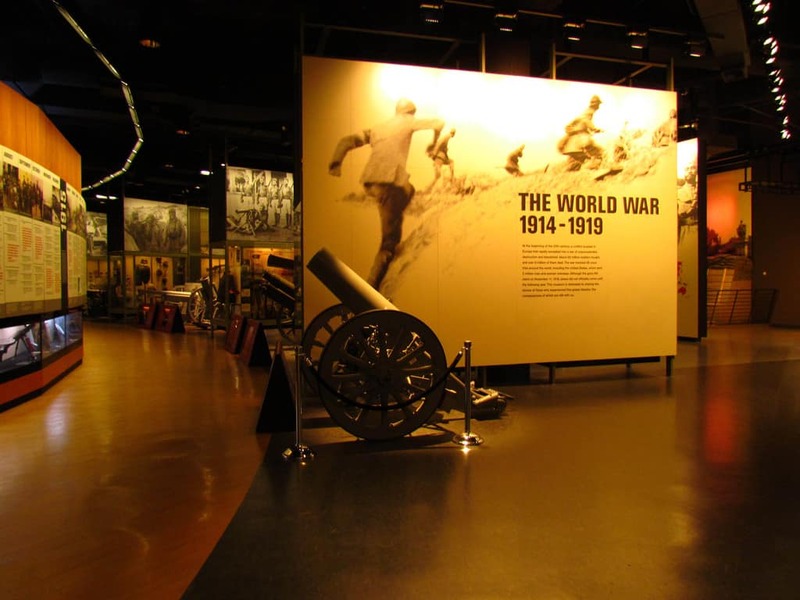 The National World War I museum sounds like an excellent museum! If you or any of your readers are particularly interested in World War I history, I’d highly recommend a trip to Belgium and, in particular, the In Flanders Field Museum in Ypres. It’s a similarly high-quality museum, in this case more narrowly focused just on the Ypres Salient. And in the countryside nearby are other sights like restored or un-restored trenches and bunkers, as well as cemeteries and memorials. Sounds like a historic place to visit. Thanks for sharing that suggestion.